Are arguments about leaving the toilet seat up or down common in your household? The Johnny Light™ is a simple, practical and very inexpensive solution to this all-too-common bathroom etiquette problem. For less than $15, you can put an end to confusion over commode seat position once and for all. The Johnny Light is a soft green night-light that is activated by a gravity switch any time the toilet seat is lifted. There is no way you can overlook the fact that a toilet seat is raised when it is outfitted by a Johnny Light. When you have a Johnny Light, the ladies in your household aren’t likely to experience and unpleasant splashdown due to a seat that was left up. 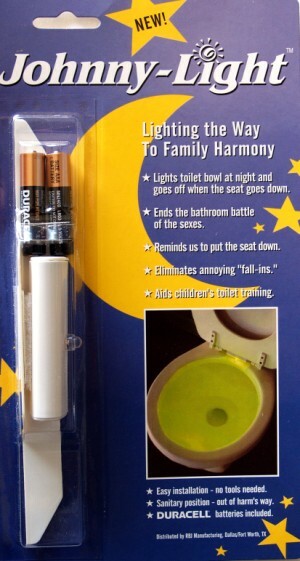 Additionally, the Johnny Light can actually help the male household members will remember to put the toilet down. The glowing green light is a pretty good reminder that the seat needs to be closed before leaving the bathroom. There are other benefits associated with installing a Johnny Light. For example, this simple gadget is an effective tool for helping potty train little boys, as the light helps them learn to aim properly. It can also serve as an important safety function for older adults by reducing the likelihood of bathroom falls due to poor visibility or attempting to sit when the seat has been raised. Johnny Light takes installs quickly and easily, and it fits more than 90 percent of toilets. You can purchase a Johnny Light from Lowe’s home improvement stores, or you can order directly from the company. Visit www.johnnylight.com to order online, or order by phone by calling 888-566-LITE.